Easy Mode - in which player A supported with the original song with vocals while humming, to guess the tune right! The hum submitted to the opponent is presented with added background music for effortless playing experience. To listen to the song while humming, players need to either place the phone speaker close to the ear or use hands-free mode. 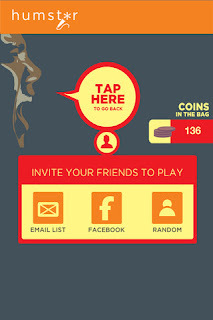 In the Easy level, each player is awarded with 1 coin for a correct guess! Medium Mode - the background music is audible while whining. The hum is submitted to the opponent with background music for easier identification. Both players are awarded with 2 coins each for a right guess. Hard Mode – there is no assistance any more- no background music is played while humming! So your opponent will not be able to listen to the song or background music while listening to the hum. Both players win 3 coins for a single right guess in this mode! • Swapping Songs - In case the player A wants to swap the presented song options to a different set of songs, player A needs to spend 40 coins for new song options. 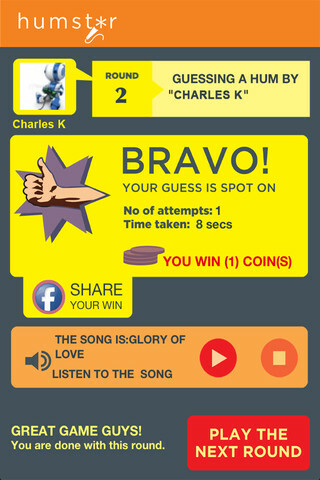 • Using A Hint - While guessing, to get a hint about the song, player B can tap on "Hint". Each hint costs the player 40 coins. • Buying Coins - Players can buy more coins from Settings > Coins > Buy more coins.